We had a couple catfish fillets in our freezer so when I saw this recipe in April's Cooking Light, it was a perfect fit. This was definitely my best frying experience to date! I think the mixture of flour and corn meal may have been the secret. 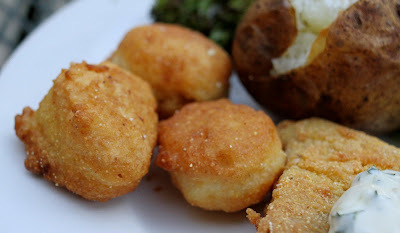 I was especially proud of the hush puppies! They were nice and soft on the inside but crispy on the outside...SO good. 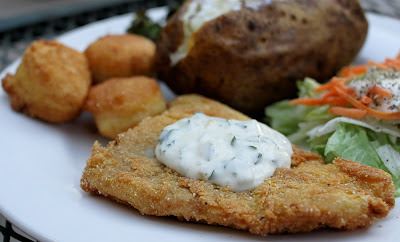 And the tartar sauce was my favorite part of the meal! I used the batter on one piece of chicken too (the girls love fish so I knew there wouldn't be much left of my fillet) and it turned out great as well, so you don't have to use fish if you aren't a seafood person. It was a bit messy to prepare (as battering and frying always is), but definitely a fun and tasty meal to eat! 1. To prepare tartar sauce, combine first 6 ingredients. Cover and chill. 3. Sprinkle fillets evenly with 1/2 teaspoon salt. Place 1 cup flour in a shallow dish. Combine remaining 1 cup flour, cornmeal, and black pepper in a shallow dish. Combine 2 cups buttermilk and 2 eggs in a shallow dish. Dredge fillets in flour; dip in buttermilk mixture. Dredge in cornmeal mixture; shake off excess breading. 4. Place 2 fillets in hot oil; cook 5 minutes or until done, turning occasionally. Make sure oil temperature does not drop below 375°. Remove fillets from pan using a slotted spoon; drain on paper towels. Return oil temperature to 385°. Repeat procedure twice with remaining fillets. 5. To prepare hush puppies, weigh or lightly spoon 3/4 cup flour in dry measuring cups; level with a knife. Combine flour and remaining ingredients. Drop batter 1 tablespoonful at a time into pan; fry at 375° for 5 minutes or until browned, turning frequently. Remove hush puppies from pan using a slotted spoon; drain on paper towels. 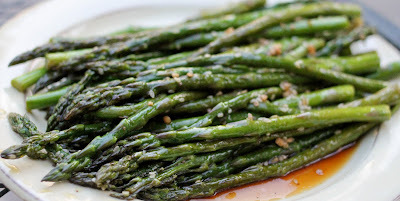 Since asparagus is my new favorite vegetable, I was excited to try this as a side when I saw it on Favorites. It was REALLY good! I added some extra soy sauce to ours. The girls still don't want much to do with asparagus besides their required one bite, but I'm hoping eventually they'll learn to love it...I know I do! Mix sesame oil, soy sauce, garlic, sesame seeds, water, salt and pepper. Place Asparagus in a skillet and pour sauce over the asparagus. Heat to boiling. Simmer for about 10 minutes or until asparagus is tender. 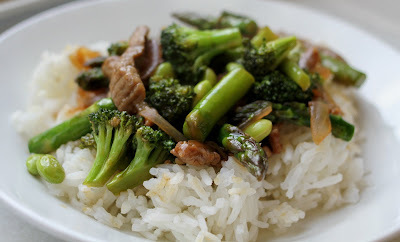 Combine ingredients for stir fry sauce and set aside. Heat a large skillet over med heat. Add olive oil and onions and cook until onions are soft. Add garlic and cook, stirring constantly for 30 seconds. Add beef and cook to desired doneness (3-7 min) Add asparagus, broccoli and sauce and cook until crisp tender, stirring frequently. Lower heat and if needed put a lid on skillet and steam vegetables until done. Add edamame and warm through. Serve over or along side rice (I used jasmine). 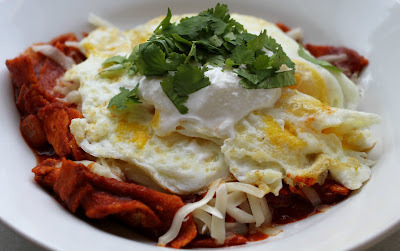 I am in love with these enchiladas...they are my new favorites! 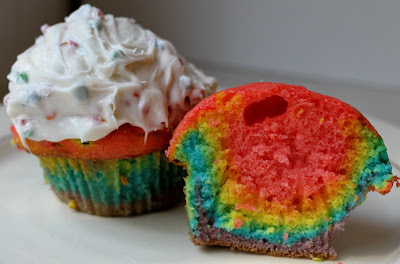 They are a little time intensive to prepare, but well worth it! YUM!!! This is another recipe from The Sister's Cafe and I made the Garlic Black Beans and Cilantro Lime Rice they suggested to go with it. A PERFECT meal (hooray for leftovers for lunch today :-)! On a baking tray, roast tomatillos, onion, garlic and jalapenos for 12 to 15 minutes. Transfer the roasted vegetables and any juices on the bottom of the tray to a food processor. (I don't have one, so just used my blender) Add the cumin, salt and cilantro and pulse mixture until well combined but still chunky. Meanwhile heat a 2 T olive oil in a medium saucepan over medium heat. Add the onion and cook until soft and caramelized - this should take 5 to 7 minutes. Add the garlic and cumin then cook for a further minute. Sprinkle on the flour and stir to ensure the flour doesn't burn then gradually add the chicken stock to make a veloute. Continue stirring over a low simmer until the flour cooks and the liquid thickens. Turn off the heat, add half of the roasted tomatillo chile salsa, some additional fresh chopped cilantro and fold in the shredded chicken meat and 1 cup of sour cream. Season, to taste, with salt and pepper. Change the temperature of the oven to 350 degrees F and begin assembling the dish. Take a large baking dish and smear the bottom with some of the reserved tomatillo salsa. Using a shallow bowl, coat each tortilla lightly with the reserved salsa mix. Put a scoop of the shredded chicken-enchilada mix on top of the tortilla followed by a sprinkle of the shredded cheese. Fold the tortilla over the filling and roll up. Place the tortillas in the baking dish and continue to do the same with all the tortillas. Finally pour over some more of the salsa and top with the remaining shredded cheese. Bake uncovered for about 30 minutes until bubbly and cracked on top. Garnish with cilantro and tomato. 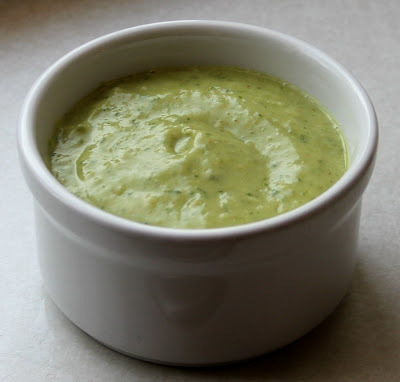 Serve hot with the remaining tomatillo salsa, sour cream, and fresh guacamole, if desired. 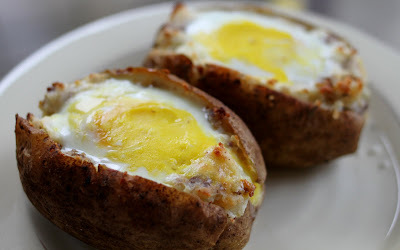 Super easy and SUPER tasty! We'll be making these again with all our enchilada and taco meals! Heat oil then add cumin and garlic until garlic begins to pop. Add the rest of the ingredients and serve warm. 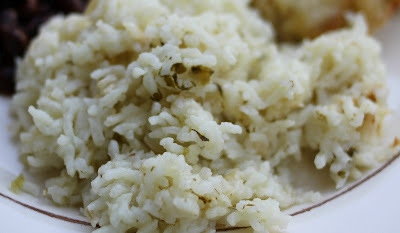 This version of Cilantro Lime Rice (from The Sister's Cafe) is even better than the version I found last year. It turned out nice and fluffy and super flavorful. A perfect compliment to any Mexican dinner! Blend cilantro, onion, and chilies in food processor. Bring water/broth to boil and add all other ingredients, simmer covered for 30 minutes or until rice is cooked. 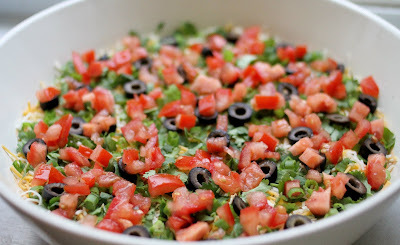 My friend Sara asked me recently if I had a good 7 layer dip recipe and I realized I have never made one myself...but I sure have eaten a lot of them :-)! We were having friends over to watch the games today though so I took the opportunity to try out my mom's recipe. It was just like I remembered it...tasty! I think the big difference from hers and the typical one is the extra green chiles and cilantro and it definitely helps it stand out from the pack. Layer beans in a large baking dish and then spread guacamole on top. Mix together the sour cream, mayonnaise and taco seasoning. Spread on top of the guacamole layer. Spread green chiles on top. Sprinkle evenly with cheese, cilantro, green onions, olives and tomatoes. 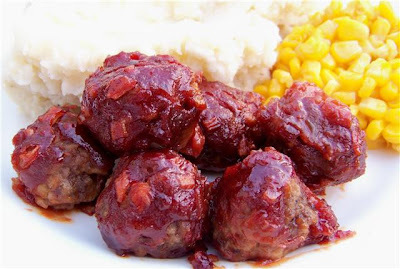 I recently came across the recipe site A Bountiful Kitchen and found lots of great recipes I want to try. This particular one caught my eye for this week though. I was looking for something "sporty" to have while we watch all our March Madness games on TV and these hot dogs were A-MAZ-ING!!! SOOO good! There aren't words to describe just how they hit the spot :-). I ate mine without a bun, of course (gluten-free), and Mike had one with and without. He said he liked it better without the bun because the bread over powered the other flavors some (and he gave them rave reviews too). I don't know if I can have a plain hot dog again. -Preheat grill - medium high heat. 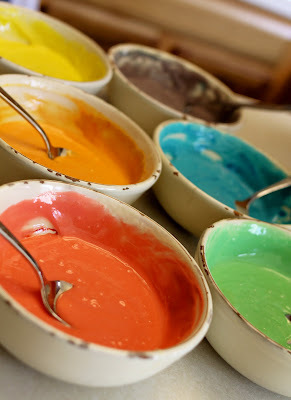 -Mix together the ketchup and mustard in a small bowl. 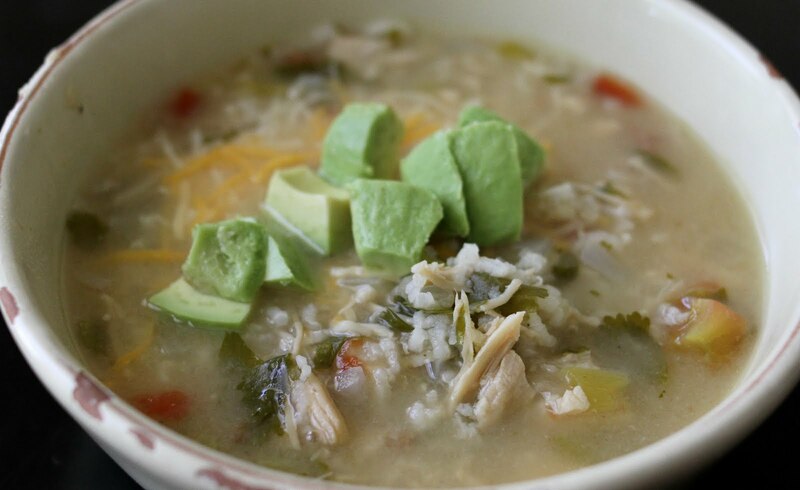 -In a separate bowl, mix the sauerkraut with the chopped onion, set aside. -Slice open the hot dogs, down the center, lengthwise, forming a deep pocket in each, but not cutting all the way through. Coat the inside of each hot dog with the mustard ketchup mixture. -Place a strip of cheese deep within the pocket of each hot dog. -Top with sauerkraut and onions. 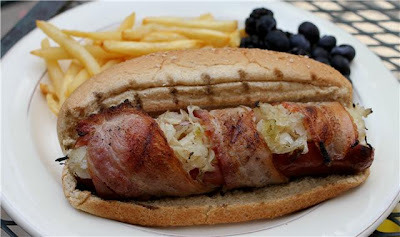 -Wrap a strip of bacon around each stuffed hot dog, securing with toothpicks at each end. Make sure you wrap tight enough so that the stuffing stays in, but not so tight so that when the hot dog expands will cooking the bacon would tear. -Coat grill surface with vegetable oil so that the hot dogs don't stick. (we didn't do this and it was fine) Place the stuffed hot dogs on the grill, stuffing side down. Grill for 2 minutes, until the bacon on that side is cooked, turn the hot dogs a quarter turn and grill for a couple more minutes. Continue to grill for a few minutes each on all sides until the bacon is cooked. Cover the grill in between turnings to help with the cooking. -During the last minute of cooking, open up the hot dog buns and place them open-side down on the grill to lightly toast. -Remove the hot dogs and buns from the grill. Remove the toothpicks from the hot dogs, place them in the buns and serve. This is another recipe from The Sister's Cafe. 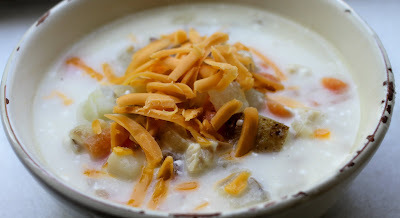 I'm one of those people who eats soup even when it is warm and sunny out, so despite our BEAUTIFUL spring weather, this is what we had for dinner tonight :-). I think it would be just as good as a vegetarian dish without the chicken. I also was thinking some crumbled bacon would be good on top, but we didn't have any. Enjoy :-)! 1. Put chicken in pot and cover with water; boil until cooked. Take chicken out of water but keep the broth. When chicken is cool, shred. 2. Saute onion in butter. Put onion in pot and add carrots and potatoes. Add 3-4 cups of the broth or enough to cover vegetables. Add 4 bouillon cubes or 4 t soup base for flavor. Bring to a boil and simmer until veggies are tender. 3. Mix flour with milk and add to soup. Add chicken back in. Soften cream cheese in microwave then add to soup in little pieces and stir until melted. Season with salt and pepper. If I could eat anything for breakfast this is what I would have! 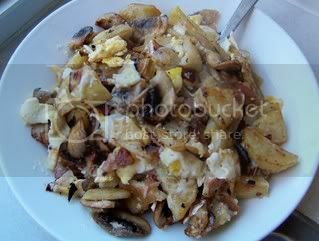 Anytime I have fresh mushrooms I HAVE to make this at least one morning...and try to limit it to only one because it isn't really that great for you :-), it just tastes GOOD! -Heat oil in a large skillet over med heat. Add potatoes and spread out to as many are touching the bottom of the pan as possible. Let them brown for 8 minutes, flipping over occasionally. When potatoes are almost done add the garlic and onions. Cook about 4 minutes. Add mushrooms and meat, continue cooking and stirring occasionally. Push the potato mixture over to the side and then scramble the eggs on the other side. Mix it all together, top with cheese and let it melt. Serve with a little dallop of sour cream and lots of freshly ground pepper. This is another recipe from the Xagave cookbook I won. Blueberries were on sale recently and I thought, why not give some jam a try :-)! 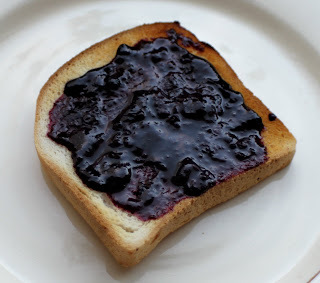 It was super easy and I have been enjoying peanut butter and blueberry jam toast every morning for breakfast! The agave nectar is such a healthy sweetener that this jam is super good for you! 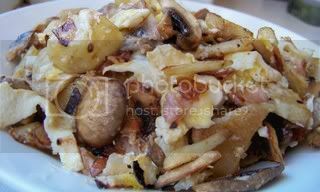 -Combine all ingredients and mash with a wire potato masher. -Place in pressure cooker, bring to pressure, and cook for 4 minutes. 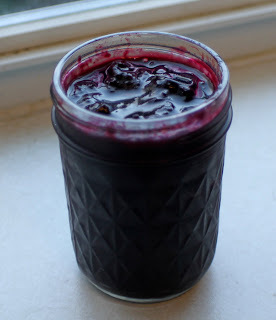 -Pour jam into an airtight container. Jam will store in your refrigerator for several months or follow standard canning or freezer jam procedures. I was excited to see a gluten-free dessert recipe (that wasn't boring) in a recent issue of Rachael Ray's magazine! Since I wasn't cooking dinner last night I finally gave them a try and I LOVED them. The girls weren't huge fans of the coconut, although they did like the marshmallow layer, but that just means more for me! -In a double boiler (I don't have one, so I boil water in a large pot and just put a smaller pot inside to do the mixing) over simmering water, melt 17 marshmallows, the butter and 1 ounce chocolate, stirring frequently, until smooth. Stir in the cereal. -Transfer the mixture to the prepared tart pan and, using a greased rubber spatula or your hands, press into the bottom and up the sides. (I put a baggie on my hand and spray it with a little cooking spray) Wipe out the double-boiler insert. -In the double boiler, melt the remaining marshmallows in the milk over simmering water, stirring frequently, until smooth; let cool. Pour the mixture into the crust; refrigerate for 30 minutes. Wipe out the double-boiler insert. -In the double boiler, melt the remaining 7 ounces chocolate over simmering water, whisking constantly, until smooth. Stir in the oil, 3/4 cup toasted coconut and 1/2 cup pecans. Spoon the mixture onto the tart and spread evenly to cover the marshmallow layer. 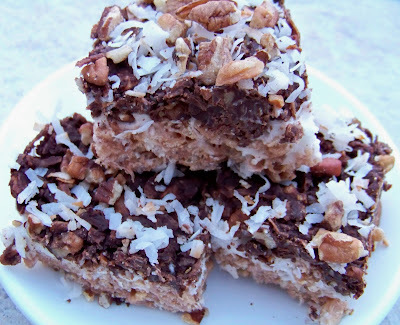 -Top with the remaining 1/4 cup coconut and 1/4 cup pecans; refrigerate for at least 30 minutes or up to 2 hours. 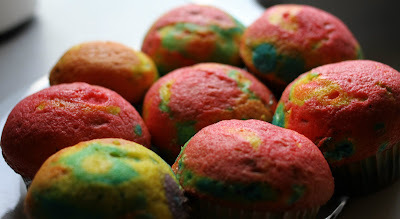 I thought these were pretty dang good if I do say so myself :-). I used the Pioneer Woman's enchilada sauce recipe, but I like chicken better (her recipe uses ground beef) and had some extra cream cheese in my fridge, so I did my own thing for the insides. I had enough filling to make 2 8x8 dishes, plus a smaller dish of enchiladas and I have TONS of sauce left still. *Prepare the enchilada sauce and let it simmer while you prepare the other ingredients. *In a large pan heat 2 T olive oil and add onions and garlic. Cook until onions are translucent. Add chicken, chiles and cream cheese, stirring until cream cheese is melted and evenly distributed. *Heat tortillas (either in hot oil until soft, or wrap 3 in a paper towel and microwave for 30 seconds...depending on how healthy you are feeling). 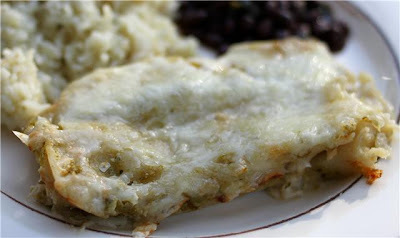 *In each tortilla place a generous scoop of chicken mixture, a few green onions and olives and some cheddar cheese. Roll and place seem side down in a baking dish that has been lightly coated with enchilada sauce (this keeps tortillas from getting crunchy on the bottom). *When pan is full, cover enchiladas with a layer of enchilada sauce (enough that all areas are covered, but not swimming in sauce). *Cover generously with Monterrey jack cheese and bake uncovered at 350 degrees for 25 minutes. 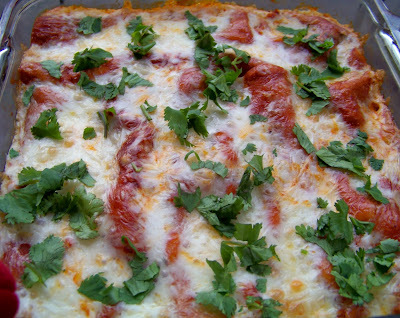 Top with cilantro (and sour cream!) before serving.